Since 1845 every Fuller’s Head Brewer has kept a hand-written book of brews. 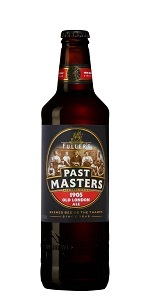 the Past Masters series is a glimpse into our unique brewing history, using our archive of knowledge to revive long-lost beers for today’s connoisseurs. Brewed in 2017, old London ale is the eighth beer in the Past Masters series. Old London ale is brewed to a Burton old recipe from 1905, selected by our brewers alongside beer historian Ron Pattinson. Stronger than mild and darker than bitter, burton old was a particular favourite in London pubs - especially during the colder months. As a bottle conditioned beer, the flavours will continue to develop right up until the moment the bottle is opened. This beer will form a natural sediment, so pour carefully and enjoy.